1. And I Darken by Kiersten White - This one sounds like a promising fantasy. 2. The Last Time We Were Us by Leah Konen - You know I'm all about the summertime love stories. 3. The Season of You and Me by Robin Constantine - Another summer romance set in New Jersey- love that! 4. Whisper to Me by Nick Lake - Another summertime romance, but this one sounds a bit more serious. 5. Ruined by Amy Tintera - I love the sound of this fantasy as well. 6. The Glittering Court by Richelle Mead - I loved Mead's Vampire Academy series, so I am excited to check this one out. 7. A Court of Mist and Fury by Sarah J. Maas - After reading A Court of Thorns and Roses, the first book in this series, I immediately added this one to my TBR list. 8. Heartless by Marissa Meyer - An Alice in Wonderland prequel by the author of Cinder...a must read for sure! 9. Eligible by Curtis Sittenfeld - A modern retelling of Pride and Prejudice. Sounds fun, right? 10. Leave Me by Gayle Forman - It's her adult debut and I am really curious about it, even though the premise seems a bit depressing. So, what books have you added to your TBR list? Let me know! This meme is hosted by The Broke and The Bookish. Oh my, I was going for already released books, so a lot of these didn't make my list, but they absolutely should have. 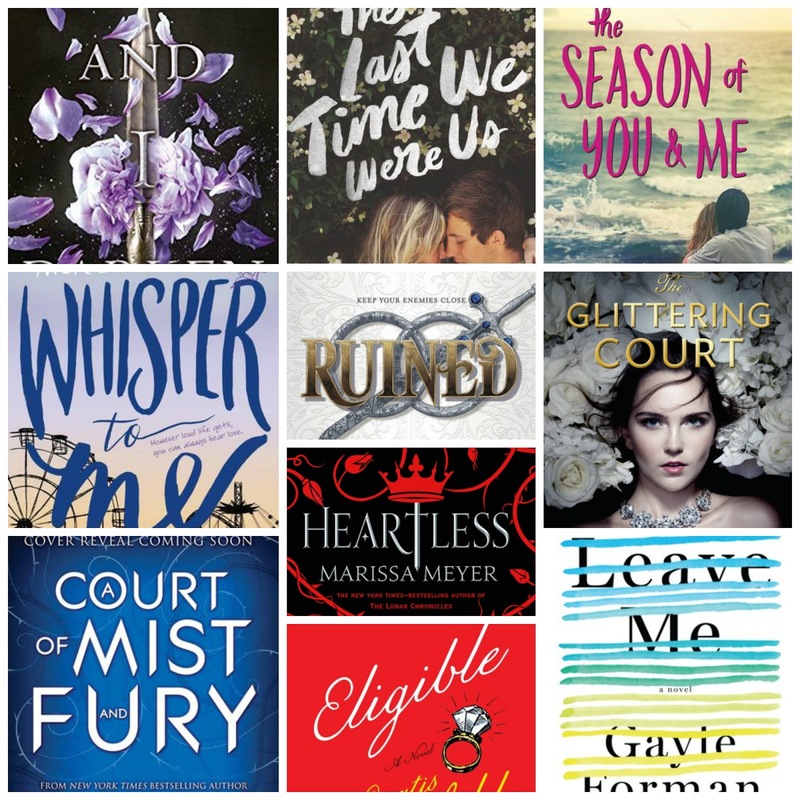 I am so excited for The Glittering Court, though Richelle Mead's other YA stuff (besides VA) was not exactly well-received, so this makes me nervous because I just love her so much. I also cannot wait for Leave Me and Heartless. Wonderful list!! I am excited for Glittering Court as well....Vampire Academy is one of my favorite series, but I never really got into her Bloodlines series though. Hopefully this one won't disappoint. Thanks for visiting, Lefty. Yes! I am totally on board for A Court of Mist and Fury. I just read the first book this year and loved it. I need to finish the Lunar Chronicles series before I start Heartless...I better get reading! Thanks for visiting, Jenny! Great picks here, Christina! I am especially excited for Robin Constantine's new book as I loved her debut. I'm also interested in reading Forman's adult debut even though her last YA book didn't totally work for me! Thanks, Leanna! I know what you mean about Forman. Some of her novels really hit home, but other ones are misses for me....hoping this adult one is pretty great, although it does sound kind of depressing. I am excited for Constatine's latest as well...love that cover! Thanks for visiting! Haha. Definitely. Gayle Forman's novels are sometimes hit or miss for me. Either I really LOVE them or they are just ok...hoping this one is great. Thanks for visiting, Tara! I can't wait for Heartless and A Court of Mist and Fury!!!! So excited for both of them! Thanks to your post I just added The Season of You and Me and The Last Time We Were Us to my TBR. Yay! Me too! I am so excited for both. I'm glad you like the sound of Season of You and Me as well as Last Time...both seem like great summertime reads. Thanks for visiting, Stephanie. ohhh an adult gayle foreman! i'm sold!! even though i've not had much luck with some of her books lately. I know what you mean, Joy. I loved If I Stay, but some of her other novels were just ok for me. Hoping this one is awesome. Thanks for visiting! I'm glad you are looking forward to both as well, Becky! Thanks for visiting! I can't wait for A Court of Mist and Fury and I am cautiously optimistic about The Glittering Court. All of these look good. Lots of good reading coming up in 2016! Me too! I am so glad I read the first book a few weeks ago. I hear you about Glittering Court. I am hoping it doesn't disappoint. Thanks for visiting, Christina! Me too. I just read the first book in the series and absolutely loved it. I'm glad you are a fan as well. Thanks for visiting, Emma! I cannot wait to get my hands on Heartless. It soundx amazing. I love the cover for And I Darken. Lots of good looking titles. Me too. I am excited for that one! Thanks for dropping by, Natalie.